When your bike is broken and needs to be fixed, you need to have the necessary item to ease the process. For an individual to deal with the problem of repairing a broken bike, one has to identify the broken part and the most suitable repair stand to do the job. Bicycle repair stand is specially made to help you lift the bike in a position where you can easily see all parts of the bike when fixing it. With this item, you do not need to move around since you can effortlessly rotate your bicycle on the stand for your convenience. It comes with different features and styles making it hard for many to make a right decision when looking for one. There are a few features you need to take into consideration like its structure, size of the base, height adjustment and the quality of its clamps. Now here are some reviews that should help you find the best bike repair stand. 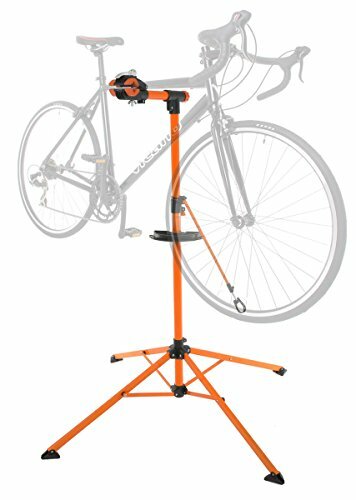 If you are looking for something versatile and lightweight, and within your budget, then the Bikehand Pro Mechanic Bicycle Repair Stand is worth considering. It doesn’t even need any assembling as it reaches you from Taiwan ready to use. It’s one of the less expensive bikes stands available today but is very stable once you set your right bike on it. Its body is made of full alloy aluminum and is light at 11 pounds but durable enough to hold bikes up to 55 pounds. It’s easily folded into a compact package in a matter of minutes, making it ideal to carry wherever you want to repair your cycle and for storage purposes. Though tic has only two legs, it’s just as sturdy as any bike repair stand with more legs and doesn’t swerve or tip over at all. It comes with a fully rotating head of 360 degrees and a rotating resin clamp that’s durable enough to clamp onto the bike’s top tube or seat post. The clamping jaws are well made and don’t pinch the bike’s brake cable. However, it’s not recommended to rotate bikes to 360 degrees as its serrated teeth design may not hold while repairing heavier bikes. The additional perk of a tool tray is a welcome addition to the bike repair stand as not many stands have one. It’s foldable and easily mounts onto the bike stand to use for holding tools and your bike parts so that you can keep track of all your screws, bolts and other stuff. However, the Bikehand Pro bike stand is not meant for heavy bikes. Though its feet are rather stable, there is a chance of a heavy bike tipping over at times. It’s also better to not do too much of heavy duty wrenching on it. In other words, one of the best bike stand for repair for casual bikers who have only light maintenance to do like cleaning and lubricating the bike. 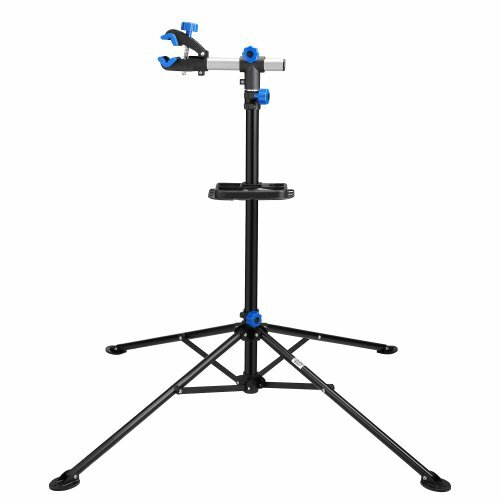 The Park Tool PCS-10 Work Stand is the bike stand for you if you are looking for something strong and durable. At 19.14 pounds, it’s practical twice the rate of most bike repair stands and can carry bikes weighing as much as 100 pounds, including some electric bikes. It’s not only its weight but it is 3-point leg system that makes the stand stable and sustainable. Its stand basically has 2 legs which are placed in a 3 point configuration, with a reinforced center yolk for additional stability. As this is a heavy and durable stand, it’s safe and possible to smoothly and easily rotate your bike 360 degrees using its composite tube top. You can now easily do all those repairs that are easier done if the bike is upside down. The stand comes with a cam-type metal clamp with a padding that provides for a single action clamping of tubes without damaging your bike. Making height adjustments is easy as the Park Tool PCS-10 has a quick-release height adjustment feature to adjust the height from anywhere between 39 inches to 57 inches. There is a drawback with the bike stand, which is that it’s not pre-assembled, and requires some assembling. It’s also not easily folded to carry along on the road with you as it’s not as convenient as other bike stands. It’s more like a bike stand that you have to set up in your garage and leave it there to use only for repairing and maintaining bicycles. So if space is a restriction, this may not be the bike stand for you as you can’t fold it up and store after use. If space is a constraint, and you need a compact bike repair stand for bike repairs, the Aluminum Cycle Pro Mechanic Bicycle Repair Stand is perfect for you. It comes from Taiwan in a relatively small box, in the size you can expect it to be in when folded. It can be in fact easily stored under a bed or closet once folded. Though compact, once the legs are folded down and the main tube extended, you realize that is indeed a very stable bike stand. It’s made of full alloy aluminum and weighs only 11 pounds, but is durable in structure. It can carry a bike weighing 25 kg at the maximum. It comes with a magnetic tool tray which is useful for storing your tools and screws while conducting bike repairs. 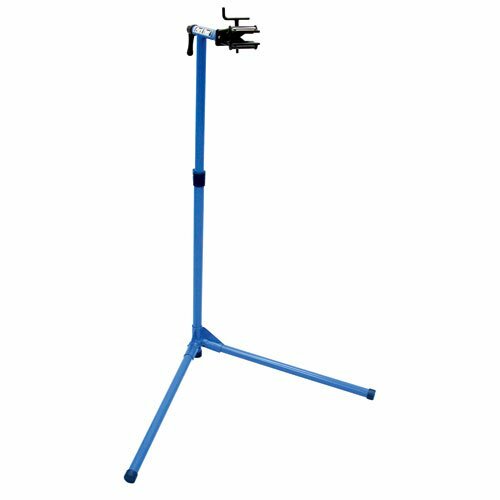 The bike repair stand has a quick release mechanism where it can be adjusted to a maximum height of 1.5m or 59 inches when extended. Its rotating clamp can be rotated to a maximum of 360 degrees when clamped onto the bike’s top tube or seat post. It, in fact, has pins to adjust at every angle through 360 degrees, which help prevent the bike from slipping no matter which angle it’s. There’s no worry about the jaws pinching cables as it is well padded. The only thing you may have to worry about in this bike stand is the quick release of the comfortable bike when in a vertical position. There is a chance of your bike dangling on the edge if you close the quick release when the bike weight is in motion which in turn makes the stand useless. This is because its opening isn’t wide enough to both admit the seat tube and tighten down enough for a good grip. Interested in mountain bike grips? Check out our article here. 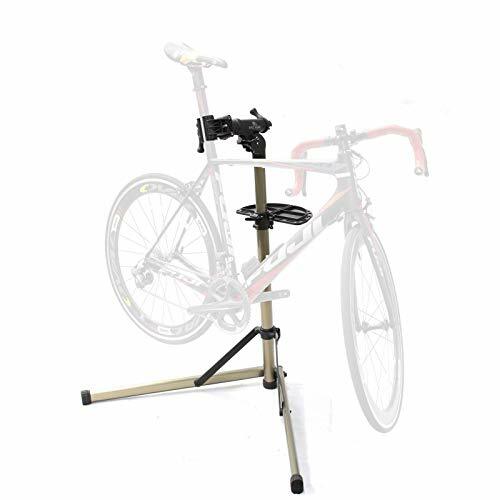 This is a portable home or shop road pro bike repair stand. It is made of workhorse clamps designed to rotate 360 degrees on two axes and fit nearly all standard frames from 1 to 1.5 tubing. 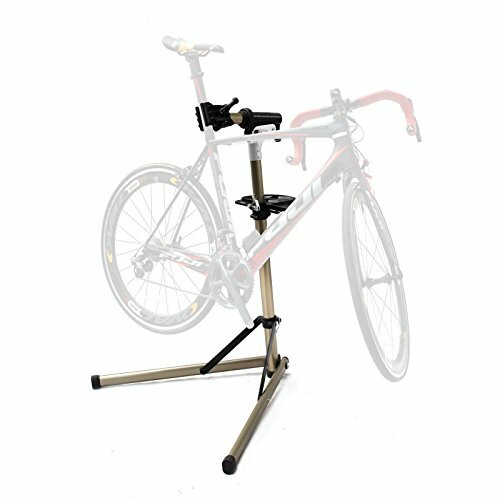 This ensures that the stand contains up to sixty-six pounds (30KG) effortlessly in heavy duty construction process without damaging your bikes finish making it more convenient to use It has an adjustable telescoping stand that can be adjusted from 41 to 75 inches and will fit standard frames. What makes this item so versatile in the market is the fact that during the process, you can mount your bike in almost any position and lock it I place with a simple twist of a knob or two. It has the adjustable handlebar rod that stabilizes the front wheel during the renovation process making the whole process easy and efficient. It has a tool fitted with a magnetic strip to secure the bold and nuts when fixing them in place. This makes the assembly and setup process super easy. This repair stand has the feet that are even just in case you have any intention of mounting RAD cycle product pro cycle adjustable repair stand to the workbench or floor permanently when you want to. The legs can fold easily making it easy to handle during storage. For solutions to your bike maintenance procedures, you can order this product from a trusted source at a pocket-friendly price that will not overstretch your budget. This is a portable repair stand for bike repair at home. It provides a proper routine maintenance of your bike that will ensure your property extends its life. The advantage of this item is that it makes the maintenance process easy by positioning it at a comfortable height and angle for you to assess all parts. It also has a handy tool tray for keeping the nuts and bolts until when you want to put them back in place. This item is made of durable steel construction materials. It has a rotating head that can adjust the clamp to any direction. It also has a wheel and handlebar stabilizer that holds the front wheel place when you are working on the property. This ensures that the property is not damaged in the process. The good thing about this item is the fact that you can adjust the height of the stand from 45 to 72 Inches to ensure that you work at a comfortable position without unnecessary bending at awkward positions. It is also made of seat post or clamp tubes that range from 30mm to 75mm in diameter that locks your bike at a position where you want. It also has legs that can fold easily for easy transportation and storage of relatively light goods. The item guarantees the safety of the tools such as nuts and bolts when fixing them since it has a magnetic strip fitted on its tray to secure them. It is also a massive duty item since it can handle up to a maximum of 50 lbs. during the construction process. When doing the cleaning, the bike is secured on a stand and then peddled freely to clean the chain, and also adjust the brakes. Conquer equipment offer quality cycling accessories you need. The stand comes in one color and one size. The head can be rotated at an angle of 360 degrees, this allows easy access to all parts of the bike during repair and cleaning this is an ultimate feature since it allows for easy access to all parts of the bike by a mechanic. The product is designed to allow comfortable and straightforward adjustment. It also crucial to check for maintenance procedures as you receive your product. All considerations were taken into account by the manufacturer to ensure that the height can be adjusted even to fit the requirements of the tallest man. This item is also portable and can easily be stored since it can be folded to 104 cm the screw clamp can be attuned to fit tubes from 24mm to 76mm. It comes with seat post to clamp to. The product weighs 17.4 pounds which makes easy to carry. Its dimensions are 39 by 11 by 5 inches. There are other types of products which performs the same function as this hence you are free to inquire about them. The product can be purchased online. Are you fed up with taking your bicycle for repairs every now and then? There’s actually not much to do to repair a cycle and is something you can do on your own. You need a few basic tools, a bike pump, and most important a bike repair stands. If you wonder you need a stand, well it proves helpful at keeping your bicycle steady while you do your repairs and maintenance. Taking a look at these top six bike repair stand reviews, it’s generally left to you to decide which the best bike repair stand is for your bike repair and maintenance needs. If space is a restriction, then the foldable Aluminum Cycle Pro and Bike hand Pro are better options for you as you can fold and easily store them and even carry the stands wherever required, they are not sturdy enough to hold heavy bicycles while you repair them. 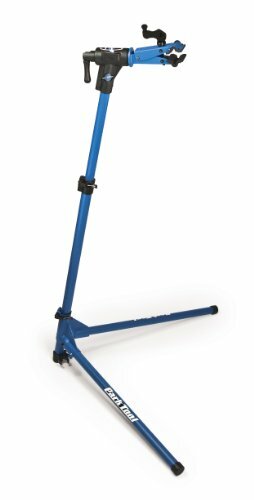 If you have a heavy bicycle, then the Park Tool PCS-10 is a better option for you as it’s a really sturdy bike repair stand. However, the drawback is that you can’t fold and keep it aside. It is an ideal set up and left in your garage permanently to use as and when required.